I finally managed to get a photograph of this bus. The British School of Kuwait BSK brought it over from London. I feel it’s underutilised and wish they would use it a little more… Maybe in spring when the temperatures are more bearable. Next week is Eid and the three-day holiday will be complimented by two extra days. This is the case for all government schools and most private schools. Noor will join us on holiday even if her school will still be open. 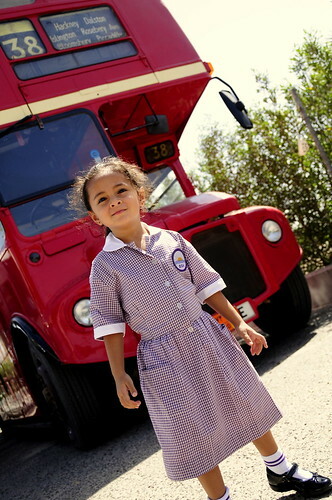 Kuwait is not really quite back to school until after Eid. It’s strange that not all schools are off. ? . I think they should make this bus into a playbus . I don’t know about the others, but the BSK told me that they have to teach 167 days of the year and they’re running out of days. I saw in the papers that a handful of private schools have asked for permission to stay open and it was granted by the minister. I always thought a playbus too ……. why not ? put in a little kitchen, den, almost like a house, or turn it into a library! they really need to use it ….. I wonder how much Mrs BSK paid for it?